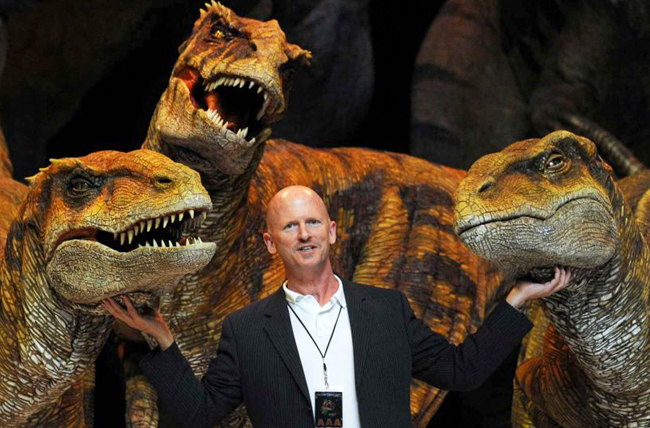 Scott Faris has walked with dinosaurs and toured the country with crowd-pleasing hits like Cats and Cabaret. Now the veteran director and stage manager is the inaugural holder of the USC School of Dramatic Arts’ endowed professorship in stage management. The first of its kind in the country, the Alice M. Pollitt Professorship in Stage Management was established last year with a $1.5 million gift from Teresa and Byron Pollitt and their daughter, Alice, a New York stage manager and an SDA alum. Initially skeptical, Faris found that every requirement for the position “was something I had done, was doing or had experience at,” he said. Miserables, City of Angels, Applause, Grease and many others. Among his numerous directing credits are the high-tech spectaculars Walking with Dinosaurs and Dinosaurs in the Wild (an immersive theatrical experience now on tour in Britain); William Shatner’s solo Broadway show, Shatner’s World: We Just Live In It; more than 20 internationally touring productions of Chicago, the Musical; national tours of Sweet Charity and South Pacific, and Bette Midler’s The Showgirl Must Go On in Las Vegas. A theatrical career was pretty much a given for Faris. A California native, he was raised in Brea by parents who loved musicals. His sister was a dancer and their grandmother had been part of a sister act in vaudeville. Faris began his own career in Orange County as a teen actor and ballet-trained song-and-dance man; shortly after moving to New York, he landed a national tour of A Chorus Line. That “feather in the cap” ensemble experience, Faris said, is what changed his career trajectory. “I realized that I didn’t want to be a worker bee. I wanted to be a boss,” he said. Taking note that “the person in charge” on the show was the production stage manager, Faris made his interest known and became an assistant during the run. The skills required to be a stage manager — musical knowledge, people skills, understanding the technical aspects of a show — “kind of clicked in my brain,” he said. A similar “click” occurred when Faris was asked to recreate the Hal Prince staging of Cabaret for an Amsterdam-bound revival of the show, a move that launched his restaging and directing career. Faris’ stage management background comes into play in every show he works on, he said. Professional development and an enhanced focus on graduates’ career opportunities are two areas that Faris is working to expand at USC.